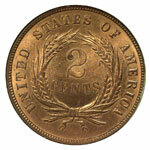 One of the shortest-lived denominations in United States coinage was the bronze two-cent piece. 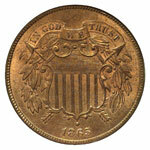 Issued from 1864 through 1873, most were later redeemed and destroyed. With the exception of a few low mintage dates and certain varieties, however, these coins still exist in collectable numbers across the entire grade span, from those worn nearly slick to pieces that have survived in mint state. 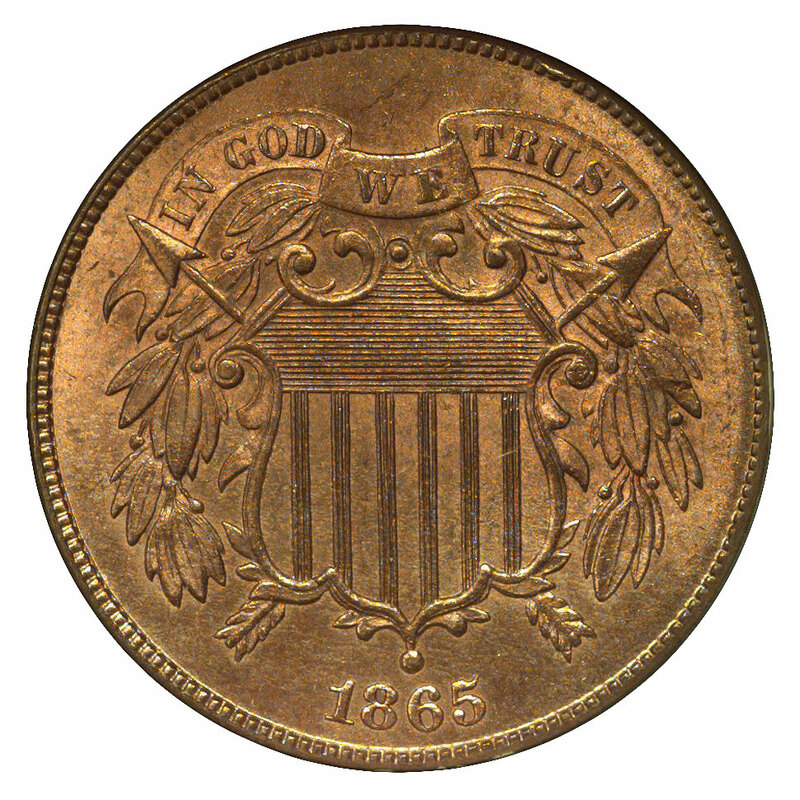 The two-cent piece is famed as the first United States coin to carry the motto IN GOD WE TRUST. Its introduction in the spring of 1864 happened to coincide with the adoption of that motto, which was subsequently added to many existing designs in 1866. The significance of the motto extends beyond its historic value, as its readability is a key component in determining the grade of a circulated specimen. The book The Official American Numismatic Association Grading Standards for United States Coins features photos and text that are quite easy to use for the circulated grades. Included in this book is the caveat that "Two-cent pieces are occasionally seen weakly struck, and with the horizontal lines joined…" While this may be true for a minority of coins from this series, I've found that it's far less of a problem for this coin type than it is for the copper-nickel coins. 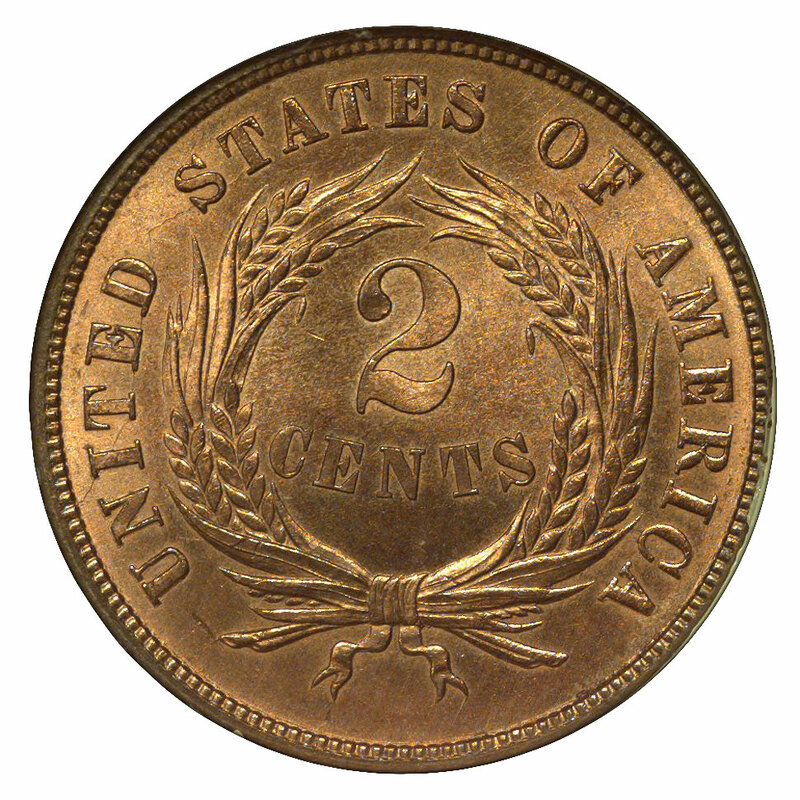 The bronze alloy of 95% copper and 5% tin and zinc was more cooperative than its harder cousin used for the three-cent and five-cent pieces. Perhaps the biggest problem in locating desirable examples of circulated two-cent pieces is their susceptibility to corrosion. Copper is a relatively reactive metal as compared to gold, silver and nickel. Even when alloyed, it's subject to a green encrustation known as verdigris. Experience will reveal ways to remove this verdigris, but even a skilled professional conservator cannot perform this operation without leaving some evidence of the corrosion. Unless you're in the mood for experimentation, it's best to simply avoid such coins. Mint state two-cent pieces are certainly more challenging to grade than circulated examples. In addition to determining the numerical grade, a third-party grading service such as NGC must designate copper and bronze coins with a color summation. The three options include BN, which describes a coin which is entirely or almost entirely brown or which has non-red toning, such as iridescent blues and greens; RB, which stands for mixed red and brown; and RD, which is used for coins that exhibit all or nearly all of their mint red color. Fully red two-cent pieces are a rarity, and most examples in such condition are from the high mintage dates of 1864 and 1865. While two-cent pieces are sought primarily for inclusion in type sets, where only one or two examples are required, the shortness of this date series has led to its being collected in its entirety by quite a few people. The keys to completion are the 1864 Small Motto variety (which some numismatists consider a pattern) and the 1873 proof-only issue. The relative rarity of each remaining date relates fairly closely to its original mintage, with the 1872 two-cent piece (mintage 65,000) being seldom encountered in any grade. The prospect of putting together a complete run of proofs is also an option, one that is not as challenging as it may seem on initial inspection. The thing to watch out for with the proofs is that many have been cleaned over the years. Depending on the severity of the cleaning, such coins may not be certified by the major grading services, yet there are many uncertified examples in the marketplace. Though less desirable than original toned or red proofs, these coins are still collectable.